The screensaver is not dead! Familiar, a startup that lets friends and families privately share photos directly to each others’ Macs, PCs, smartphones, and tablets, has been steadily gaining traction following its beta launch last winter. 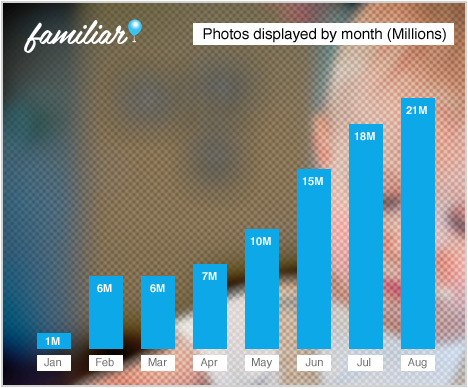 The company just hit a milestone of 21 million photos shared through its platform in the month of August, and is today announcing that it closed a $1.3 million round of seed funding earlier this year. Investors in the round include Greylock Partners, Redpoint Ventures, Index Ventures, Acequia Capital and Allen & Company. The new additions join Familiar’s previous investors and advisors, Hadi and Ali Partovi (early advisors and investors in Facebook, Dropbox and Zappos), as well as Nat Brown, Dave Goldberg, Blake Krikorian, Emil Michael, Owen Van Natta, and others. Familiar (great name, by the way), first launched into beta in November 2011 with a very simple concept: It allows users to take advantage of their idle screens to display photos, as was fairly common back in the era of the Windows PC. On the desktop, Familiar offers a new spin on screensavers by allowing friends and families to automatically send photos to each others’ computers. With the convenience of always-on broadband connections, automatic updates bringing in new photos are no longer a problem. The service can also tap into online photo-sharing services like Facebook, Picasa, SmugMug, and Flickr, and it supports photo-sharing via email. 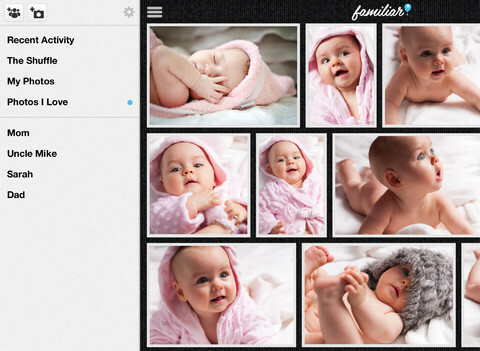 Since its launch, Familiar has expanded to iOS (iPhone and iPad), Android (phone) and the Kindle Fire, where it now offers a mobile app for private photo-sharing. According to Familiar CEO Marcus Womack, the funding allows the company to now move quickly add new features, like the addition of AirPlay support on iOS, a “save” function for the desktop apps, and support for shared videos. The service is even designed with “the normals” in mind – something which is, sadly, still rare. For example, when you invite a family member to join by downloading the app, it doesn’t force them through a tedious registration process. Instead, Familiar actually pre-creates an account for them so all they have to do is click download and enter their name. It already knows who they are. Based in Seattle, Familiar is team of five, including Womack’s co-founders Mike Bohlander, Ray Fortna, and Josh Hepfer, and later addition Aakash Kambuj. The first four had previously worked together in 2006 at iLike, the social music service acquired by MySpace in 2009. The plan now is to add a few more engineers over the next six months as product development continues. You can download Familiar here. Go install it on your family members’ devices next time you see them.